THE GIRL SCOUTS OF LOWER PRICE HILL NEED TO SELL 1,500 BOXES OF COOKIES TO GO TO CAMP. BUT THEY CAN’T TALK ABOUT CAMP. NOT YET. THEY DON’T NEED FALSE HOPE. To most troops, Girl Scout Camp is a given. For Girl Scout Camp 49632, it’s a dream. Girl Scout Troop 49632 is Lower Price Hill’s first in so long nobody remembers the last time there was a traditional troop in the neighborhood. It’s so new, the night ahead is only their sixth meeting. And, of course, like everywhere else in the nation, it’s Girl Scout Cookie time in Lower Price Hill. They’ll have to sell 1,500 boxes of cookies – $4 boxes of Thin Mints, Samoas and Trefoils – for all 17 girls in the troop to go. But camp isn’t a sure thing. 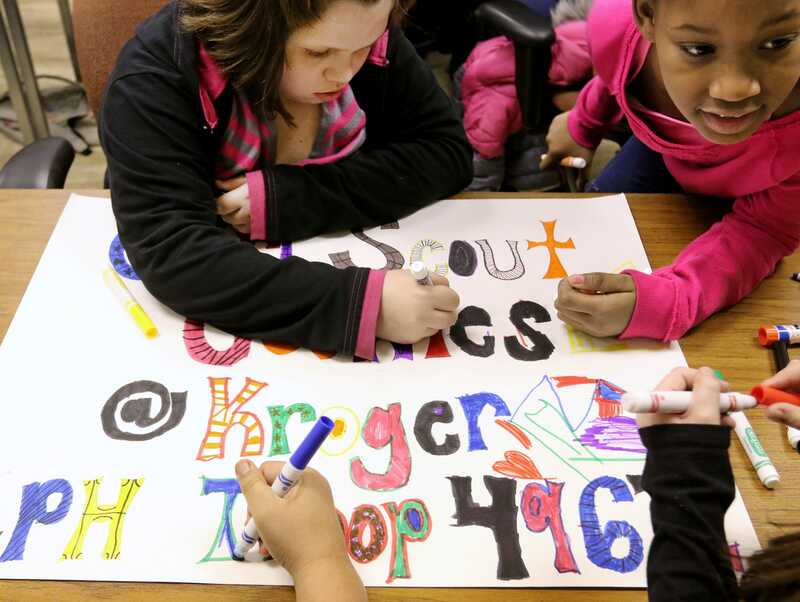 The Lower Price Hill troop joins 17,000 Girls Scouts locally. Inside Community Matters, the girls convene at long tables in a sparse, but tidy room. Inspirational Cincinnati State posters decorate the room that’s used for GED tutoring during the day. There’s a brief scuffle over the last “rolly chair,” an orange office chair that has seen better days, but on this night means a fun spin around the room. Animals crackers and water in donated Hudepohl paper beer cups are passed around. On tonight’s agenda: Sign-making for upcoming cookie sales outside of the West Price Hill Kroger. First though, the girls raise three fingers in the air for the Girl Scout Promise. A hush falls over the room, 9-year-old Gymila Jeffreys starts the group off. “On my honor, I will try to serve God and my country; To help people at all times; and to live by the Girl Scout law.” They accidentally leave out the part about serving God, so they repeat it. Adrianna Daniels, 9, Eumayah Solomon, 9, members of Girl Scout Troop 49632, work on a poster they’ll have on display when they start selling Girl Scout cookies in March. This is the first year for this Lower Price Hill Troop, and their leader, Ebony Butts, is determined they’ll make it to camp this summer. They need to sell 1,500 cookies boxes to make their dream a reality. The troop meets weekly at Community Matters, where Butts is director of youth outreach. She is an AmeriCorps Public Ally. The group of 15 on this night – some who were dropped off by parents – break into smaller groups and huddle around white posters ready for decorating. Butts offers a quick and easy marketing lesson: “We need pretty posters so the cookies will sell. Don’t color over the letters.” Immediately there is a run on pink markers; more are brought out. “What about glitter?” someone asks. Butts nixes the idea as messy, suggesting it would be better to add glitter on site. It’s the kind of project Girl Scouts all over Cincinnati were likely doing in the midst of the group’s biggest fundraiser of the year. But life outside the walls of the community center are unlike any other Cincinnati neighborhood. 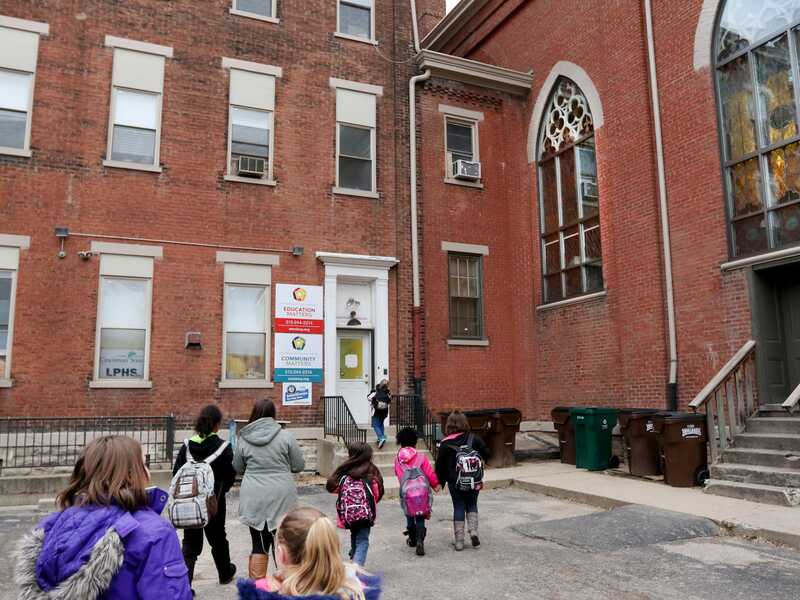 Though it’s small – just 16 blocks on the west edge of downtown – people don’t ever leave the the mostly Appalachian neighborhood of about 1,000 residents. Life expectancy is around 68, 20 years less than just a few miles away in Mount Adams. The high school has a 47 percent graduation rate. Girl Scouts, both Brownies and Cadets, make their way into Community Matters in Lower Price Hill for their weekly meeting. Troop 49632, in its first year, has 17 girls from Lower Price Hill, East Price Hill, Westwood and Cheviot. Ebony Butts, troop leader, started the troop back in January. Butts is also an AmeriCorps Public Ally and the director of youth outreach at Community Matters. Jen Walters, President and CEO of Community Matters, said the troop truly belongs to the neighborhood. “They take great pride in ownership,” Walters said. “Lower Price Hill is meeting the needs of Lower Price Hill from within, rather than somebody coming in to fix the problem.” Butts, 32, grew up just up the road in East Price Hill, back when there were only few black families. She was a Girl Scout; her mother, the troop leader. She graduated from Mount St. Joseph with a degree in paralegal studies, but abandoned that career path for social work. She’s five months into a two-year stint as an AmeriCorps Public Ally. In that role she’s the youth director for Community Matters, the resource center in the heart of Lower Price Hill. When she decided to bring a troop to the community she found there was no troop on the west side of Cincinnati that was available to these girls. You had to go to a certain school or attend a certain church to be in those troops. At Butts’ first meeting in November, a pizza party rally, she ended up with just four girls: her daughter, Jordyn, her two nieces and another leader’s daughter. So she stood outside Oyler and talked to girls there about Girl Scouts. She stuffed fliers into mailboxes. She knocked on doors and talked to parents. THERE’S A LOT OF FALSE HOPE AROUND LOWER PRICE HILL. THESE GIRLS DON’T NEED MORE OF IT. Selling $4 boxes of cookies in a neighborhood where the median income is $9,600 a year is no easy task. In most troops the top sellers win prizes, they get to go to camp. Here, in a parent meeting, everyone agreed: “It’s either all of us or none of us.” There are no prizes, save that. As the girls fill in bubble letters on the signs with pink and black stripes and tiny heart patterns – or as one 7-year-old did, a two-story house – on the posters, there’s no talk about camp. 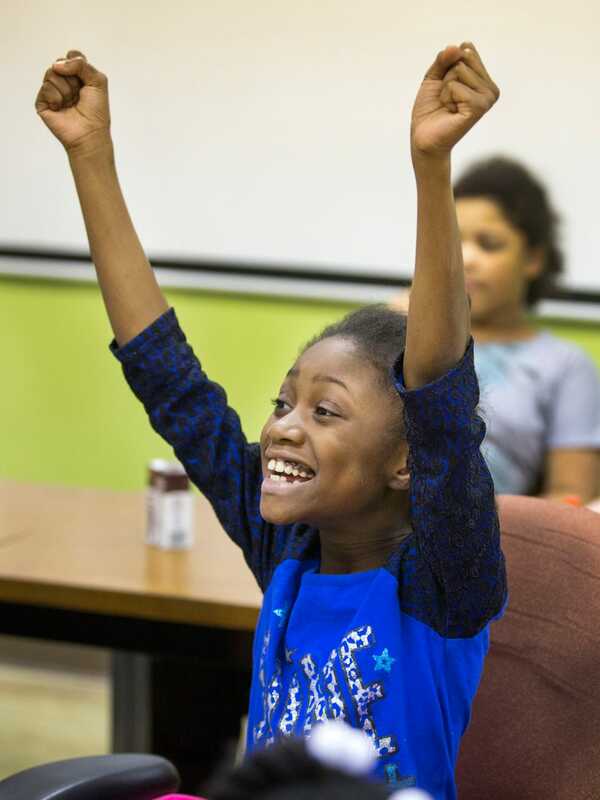 JaShanti Butts, 9, gets excited at the start of Troop 49632’s weekly meeting at Community Matters in Lower Price Hill. This is their first year, and Ebony Butts, troop leader, is determined they’ll make it to camp this summer. They need to sell 1,500 cookies boxes to make their dream a reality. Butts is also an AmeriCorps Public Ally and the director of youth outreach at Community Matters. “I don’t want to give them false hope,” Butts said. “There is a lot of false hope in Lower Price Hill and East Price Hill … People say we’re going to do this. And then you’re waiting for it to happen and it never happens.” So when they sell all the 1,500 boxes of cookies, they’ll talk about camp. Louie Bolin stands awkwardly on the outskirts of the meeting as it wraps up; he’s there to walk his daughters, 7-year-old Destiny and 8-year-old Jasmine, to their home around the corner on Staebler Street. The Girl Scouts are somewhat of a mystery to the 43-year-old, whose hair is held back in a black Sons of Anarchy bandana. But as soon as he and his wife heard a troop was being started he said they signed the girls up. E-mail Jen Walters at jen@cmcincy.org with orders. Then send the money in her care to 2104 Saint Michael St., Cincinnati, Ohio, 45204. Companies can sponsor a Cookies & Milk Break. The cookies are provided by and served by Girl Scouts between March 6 and March 29. Cookies must be pre-ordered and will be credited to the troop specified. Call Brittany Troescher at 513-619-1434 or brittanytroescher@girlscoutsofwesternohio.org to plan.